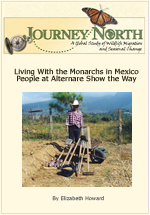 Alternare is a Mexican organization that works with local communities in the monarch region. They are building a model for living that protects the forest and the people. This slideshow illustrates real-life examples of successful conservation strategies. How can people conserve the forest for the monarchs and also meet their own needs?